Start the year off with a bright bang! These golden fireworks will set off a chain reaction as they explode, giving your friends first the light, then the motivation to start the journey into the New Year. 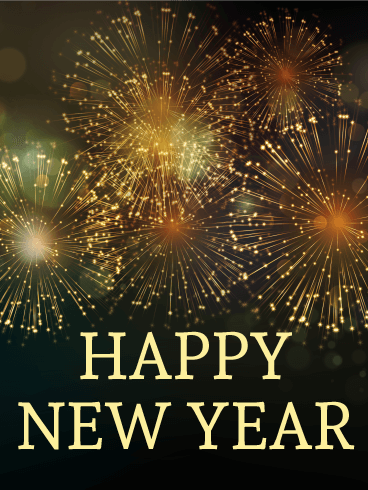 Each "boom" is another bit of encouragement to start the New Year right and to ring it in with the golden promise of a better year. Glam up New Year's Eve with this shinning New Year card! 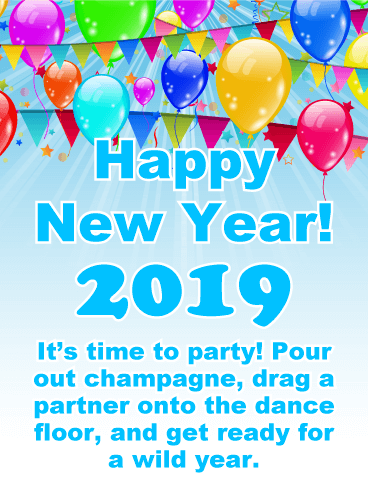 Full of the glitz, glamour, and glitter of a New York City ball drop, this card brings the best New Year's Eve party straight into the homes of your friends. Ensure your friends stare 2019 with all the style of an international celebrity and let the confetti burst when the clock strikes midnight! Start their New Year right with this bright set of fireworks. Loud and gorgeous, these blue fireworks are the perfect start to an exciting year. They're the starting gun, the guiding light, and the larger-than-life sensation of being part of something incredible. With this fireworks show starting someone's New Year, the next 365 days are sure to be incredible. This New Year's card is bursting with 80s style awesomeness! We love the exploding fireworks and flashy gold font and so will you! 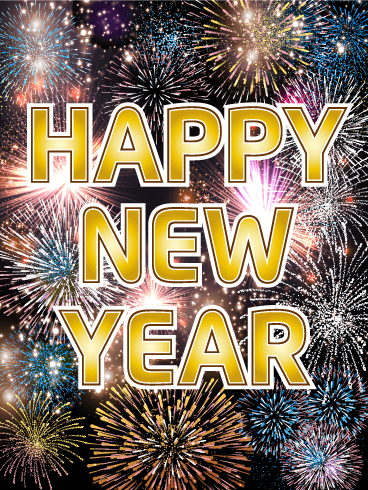 Celebrate the New Year with this retro New Year's card and send it to someone you think is pretty cool. 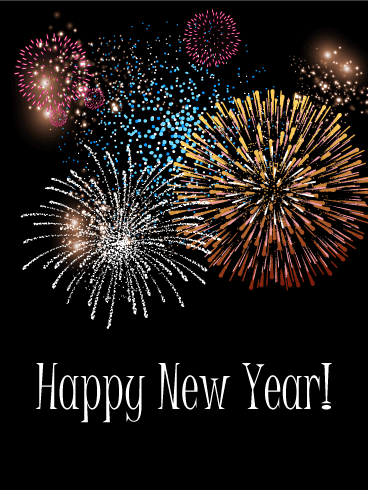 Share the best New Year wishes with this beautiful fireworks card! Just as these fireworks share the sky, what makes a year incredible is the people we share it with. So establish from day one the memories you will build and the people you wish to see. Structure 2019 to be the best because you will spend it with the best people. 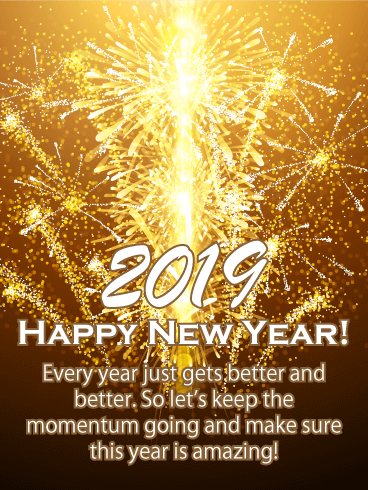 Send this Happy New Card to all those you wish to see in 2019! 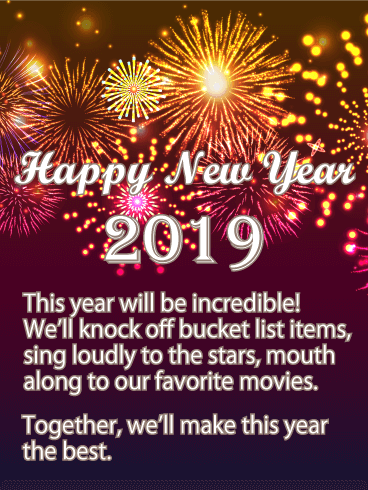 Start 2019 with a bang! 2018 might have been an okay year, but 2019 is going to be amazing. It'll be the start of a bright future, of incredible adventures, tearful reunions, and bucket loads of happiness. In short, it will be the best year ever. And you will make it so - together. 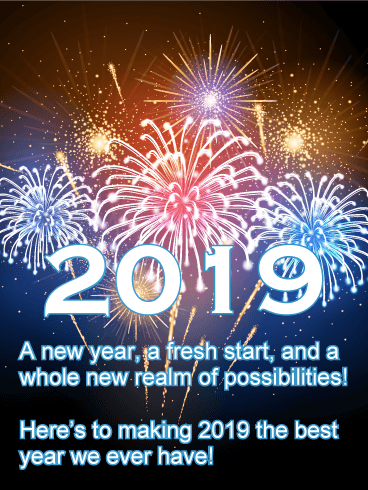 Send this card to your friends and family so they know the plan - to make 2019 absolutely amazing. 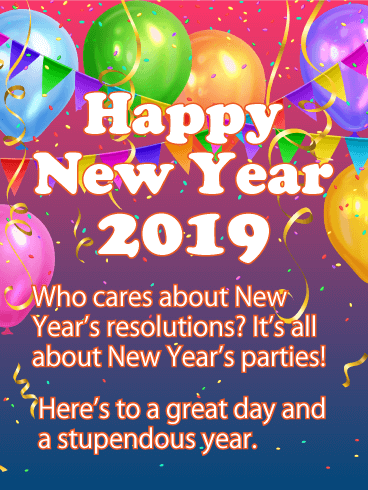 Don your party hat and grab a noise maker, because it's time to welcome 2019 with welcome arms! 2018 was amazing, but it's something you and your friends can build on. 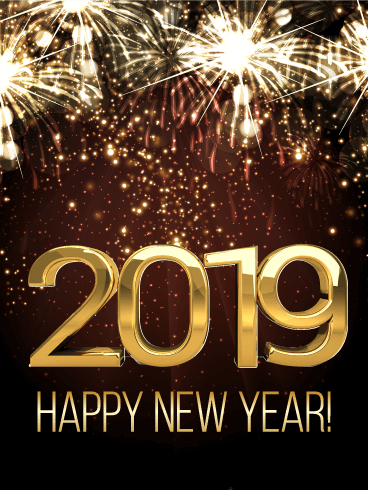 Together you can go out and concur the world, building memories you'll recall forever and making sure your wishes for 2019 are met. Wish your loved ones a happy New Year with this bouquet of fragrant roses. These pink roses represent admiration, joy and gratitude. The baby's breath stands for unity and every lasting love. Together, the floral arrangement on this New Year card is a sign of thanks and commitment. Together, you had a fantastic 2018. And now, you'll make the New Year incredible. Ring in the New Year with a touch of class. High quality champagne. Golden candles. An incredible firework view. The company of someone special. Bring all these together and you have everything you need to welcome the New Year in style. 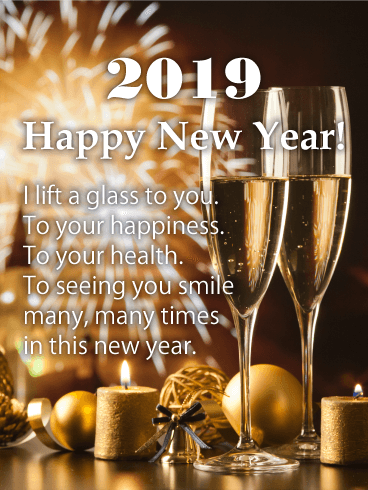 Start 2019 by lifting a glass to the important people in your life and letting them know how much you care. Near, far, or a hand hold away, everyone should heard "Happy New Year" from you. 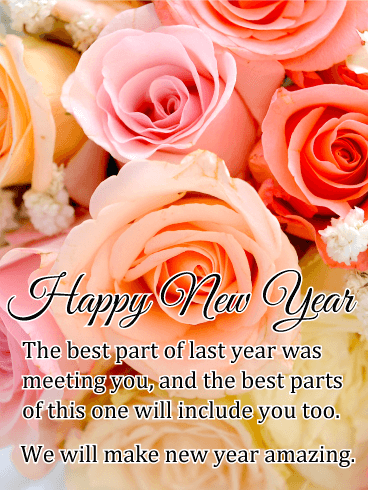 Celebrate last year and look ahead to the future with this floral New Year card! It's those who are closest to us that make a memory good or bad, and to surround yourself with those who bring you joy is something we all strive for. Thank your loved ones for being amazing and let them know you intend to keep brightening each others' days in the New Year. Ring in the New Year with a bang! 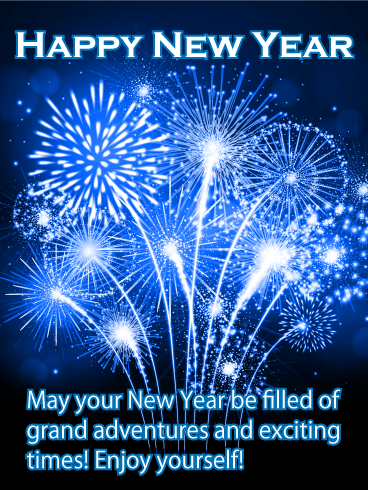 This festive New Year's card is the perfect way to wish someone a happy new year because, who doesn't love fireworks? They leave us in awe as they light up the sky in sparkling colors. Start the year right with this golden array of sparklers! Bright sticks used to celebrate summer picnics and festive birthdays, these small, individual fireworks are also a beautiful, personal way to herald in the next big thing - 2019! 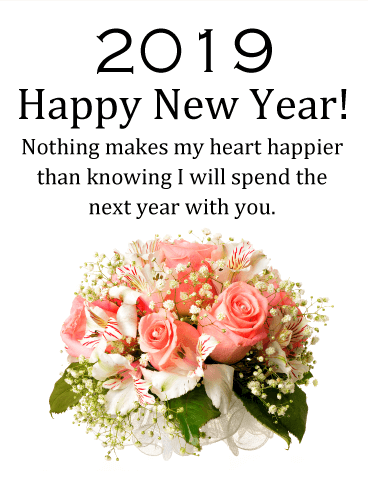 So send this sparkling bouquet and make sure your friends and family start 2019 with a good memory and keep the momentum going the entire new year.